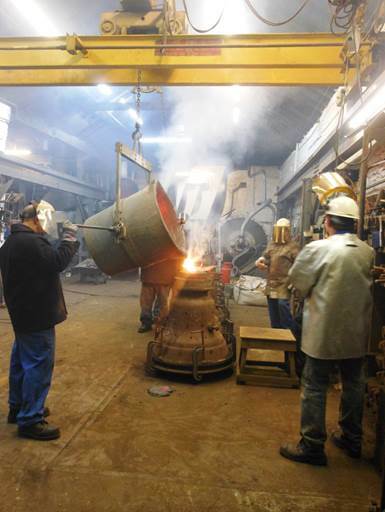 Three new bells to convert Adlestrop's existing five bells into a lighter ring of 6 were cast at Whitechapel Bell Foundry on July 24th in the presence of their donors. The request for a faculty includes retaining the existing treble, the 3rd and the 4th for retuning as the 4th, 5th and tenor of the new remodelled ring. The new bells will be the treble, 2nd and 3rd. The old tenor is cracked and is to be scrapped. The old 2nd bell will become redundant and faculty permission is being sought to sell for use as a ringing bell elsewhere in the Guild's area. The new ring of 6 will have a tenor weighing about 5cwt. Whitechapel Bell Foundry is undertaking the rehanging work. I am truly grateful to Martin Penny for completing this Newsletter. Helen and I had planned to go to the South of France in our campervan, but the dates allotted extended across the production date for this Newsletter. Panic. It was either completing it early before we went in mid-September, or late when we returned in early October. The only other option was to find someone brave enough to finish it for the normal date — and Martin stepped in (and even had a smile on his face when he agreed). Thank you from me, Martin, and probably from all members! From what I can see before I go on holiday this will be another large Newsletter. I can only thank those who have contributed — and it appears more members are doing this. It all makes for a good, wide-ranging read. Talking of wide-ranging reads, Chris Seers article on the parallels between ringing and meditation (p.6) is a little off the normal run of things - and this is precisely why it s a good read. Other articles of this nature are welcomed. 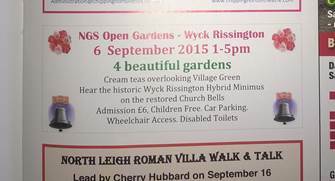 You will notice I rang in the peal at Wyck Rissington. As Nick s story on p.9 tells, the peal was a fair time in the making, as indeed was the getting-it-together to ring the stuff.Whoever said ringing Minimus was too simple should try Wyck Rissingtom Hybrid Minimus. Everything happens very quickly, so bust-ups can occur quickly, too; and the whole course is long. You need to concentrate all the time — letting it float along doesn t work!! I vowed I d never ring a peal of Minimus, but this was a worthy addition to my list. Oddly, too, although 2h-45m would seem to be slow, it never felt like it. This was due to the considerable amount of jumping about in the method — plain hunting up and down with the odd dodge or so is quick and easy. In fact the time went surprisingly rapidly. There was no time to get bored. Beware Nick asking if you d like to, etc…! Seriously, though, thank you Nick. You were a truly excellent team manager. I wonder what else you have in mind…? The Bells to Remember quarter peals are again very moving, three being rung on the actual day of the centenary of the death. I have been reading much about WW1 and the conditions under which the soldiers lived. Not kind at all. Helen and I have visited a number of battle sites in France and Belgium. The British military cemeteries are truly stunning in being so well-kept. In fact well-kept is far too limp a description. Manicured is much more accurate, even out in the middle of nowhere — and with not a trace of graffiti. Every one is worth visiting. The Guild s performance at the Great International Striking Competition at Longborough recently was a cause for huge jubilation, both by the band and by the Guild. Devon call-change ringing is notoriously very high-class, and trying to better the quality of striking produced by the Devon bands competing was a forlorn hope. To obtain 3rd place overall and the highest-scoring method band was unbelievable! We must be doing something right. Avid readers of From the Archives will be disappointed this time. There is nothing from either 100 years ago or from 40 years ago. Sorry, just one of those quirks. 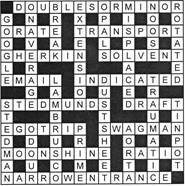 But El Pres is back with his crossword!! I m delighted my plea for more news items from the eastern side of the area brought forth such delights from Great Wolford. Thank you for these, Isobel. Please keep them coming — and I encourage others over that side to do similarly. Yet another 18-page Newsletter hits the streets. Thank you for all the submissions. Change ringing is a British Art. It grew up in the 17th century, when Britain was a growing nation and the art has spread throughout the English speaking world. It is one of what might be called the arts of the people, which began spontaneously in many towns and villages. It remains today an art of the people and it has never fallen into disuse since it first began. Until now it has never needed encouragement, for it has owed its survival to the persistence of the many ordinary ringers who pass it on, and it is sometimes envied by other arts that have to depend on outside encouragement and even subsidies for their survival. After the Reformation the Puritans thought many of the arts were sinful and ringing in the 18th century was pushed into the secular world. This changed in the 19th century, when the Church revived with the Oxford (high Church) Movement and ringing along with a number of other arts became more connected with the Church. The clergy were prominent in reforming ringers by founding the many Diocesan associations of ringers. Throughout the 20th century ringing remained strongly connected with the Church; however, now in the 21st century, ringing is once more in decline according to the Central Council's Ringing Trends Committee. It is surely good to learn that new initiatives are taking place in the teaching of ringing. 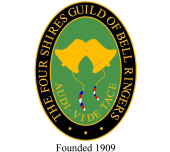 Ringing Centres are being established, together with training days and courses under the leadership of many of our associations/societies/guilds. These are providing high standards of tuition from competent ringers. The Committee met on Tuesday 18th August at the Wellesbourne Church Centre. Peter Quinn, John Carroll and Jackie Hands presented apologies. The Minutes of the May meeting were agreed,. Oxon towers: conditions under which these towers operate are clearer now. Kingham appears to be the problem and a letter will be sent to the PCC there. Guild badged clothing: Matthew showed some samples of what a proposed company for this can do. These were impressive and need little work to refine to our satisfaction. Hopefully this company will provide another source for our clothing. Hon Secretary: 4 new members had been proposed and seconded as the Rules for membership dictate. They are: Alan Curry (Bretforton); Murry Newbury (Unattached), Christine Seers (Unattached) and Lucy Gwynne (unattached) Their elections were confirmed. Treasurer: Michael D presented his report: no comments, other than to distinguish between what BRF account money is committed in grants and what is not, the latter being available for further grants. 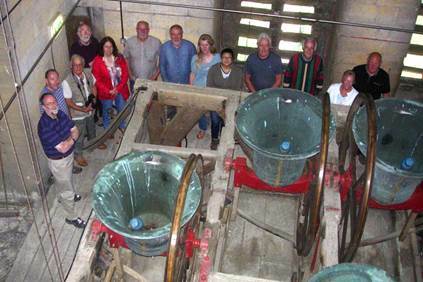 Ringing Master: reported that the Ringing Tour in Hampshire was attended by 18 people. Also the recent Saturday practices have attracted an average of 17 ringers. There was one failure to get enough (Welford). Saturday@six Qs have declined slightly recently. Membership Sec: reported that some late subs have come in. Fixture Sec: concentrating on obtaining the next batch of towers. Newsletter Editor: reported that he will be away for when the next issue appears and that Martin Penny has agreed to finish it off for publication. CCCBR: Chris said his report appeared in the last Newsletter. There is a new initiative by the Admin Committee was started at the Council meeting at Hull, and at present he is the contact for this. Sherbourne: an application had been received. It will be considered at the November meeting. AGM & Striking Comps: the tower, Vicar, organist and the Village Hall have been arranged. Richard obtaining the judge. Martin Penny deciding where to site the judge. InterShire Comp: this will be on 21st November at Shipston-on-Stour. John N is contacting teams from Worcs, Glos, Oxon and Warks. Xmas Party: will be at Badsey on 12th December. Guild Annual Dinner: Peter Q normally organises. There was a discussion about a change of venue, but it was decided the default location is the White Hart at Moreton. Next Meeting: Tues 17th November 2015. Location and time to be announced. Future Committee meeting dates: all 2016 — 16th Feb, 17th May, 16th Aug, 15th Nov . The weekly practices have again been very well attended and the Ringing Master has either run them or a deputy. 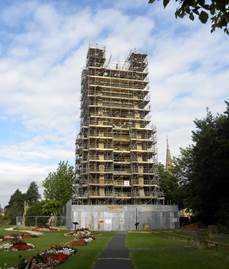 Most of the towers which are usually rung at during the year have welcomed The Guild back, and Stuart Cummings has done a sterling job in arranging all the towers. 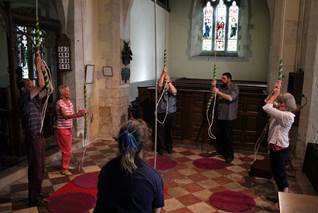 The Ringing Master has also been able to arrange quarter peals on some Saturdays before the main practice and has invited ringers who have rung their first quarters. The Guild performed well at the Striking Competition at Longborough, being the highest-placed method ringing band. This was a good day, with formidable opposition from Devon call-change bands. Thanks go Richard Lewis-Skeath for organising the Annual Ringing Tour in the New Forest Area of Hampshire and everyone who joined the tour said it was an excellent day. The website under Roland Merrick is still projecting an active Guild to the web world and the Guild Magazine is now read online and also displays The Guild clothing. The Guild also has a Facebook group which is administered by Richard Lewis-Skeath- just let him know if you are interested in joining. Chris Povey is still editor of “The Four Shires Magazine” and our thanks must go to him for producing each quarter an excellent product and as I have said in previous years the magazine has taken on a new dimension, in editorial content. The printing is still done “in house” by a few members producing a good quality magazine. Published in the Magazine is always an abridged copy of the current minutes of the Guild Committee meetings so that all members are notified of any important business, and they can inform the secretary of any items they want discussed at committee meetings or needs clarification. Finally thanks should go all members of the committee for their commitment and hard work, and for the time they have given to attending the committee meetings which were held during this year. Also to Isobel Murphy for the work she does in coordinating the FSG monthly tours. Eighty years ago, my father Denis John, transported the then strong Mickleton Boy Scouts troop to their annual camp at St David s in Pembrokeshire. This epic journey was often related to me as a child, and I was utterly amazed that the mode of transport was a Chevrolet lorry (registration number DG 1570), which belonged to the renowned Mickleton builder Harry Grinnall & Sons. The Scout Master rode in the cab alongside father; the Scouts on the flatbed lorry amidst tents, pots and pans, etc (Health & Safety??!!). The journey took many hours, but time meant nothing to the young lads. Whilst at camp, father himself had lots of time to kill and made the most of this to search out the local history. He was a regular ringer at St Lawrence s Church (see the peal board in the Ringing Chamber), and when one evening he heard the bells of St David s Cathedral ringing out, he made his way over to the tower. I was welcomed with open arms, he said, and thoroughly enjoyed this opportunity to ring the bells. NOW I ASSUME EVERYONE HAS A SPECIAL AMBITION IN LIFE? I have, from my earliest ringing days (aged 11 years) and always wanted to follow in father s footsteps . My ambition came to fruition when I rang at St David s in July. My daughter, Helen, made contact with the Tower Captain. Any chance of my father participating in ringing on the Cathedral bells? Helen found the tower captain most obliging and she organised a short holiday in the area for the two of us. I must admit that on the morning of Friday 17th July 2015 I was just a bit more than apprehensive. How would I fare ringing with specialist campanologists on 10 bells (rather than the 8 at Mickleton)? Had I been over ambitious? No! Be positive and show confidence. The entrance to the ringing chamber was via 39 steps. The bells hang in a tower that s detached from the Cathedral. Mr John Davies (the tower captain) welcomed Helen and greeted me with open arms. His easy-going manner eased the tension and we chatted about the bells and the area in which we live. I don t know how many are coming tonight, he said, and as practice time arrived, precisely three appeared. We ll ring five, he said. Mr Kinchin, would you like to try a bell or two to get the feel? he enquired. Personally, I think he wanted to assess my ringing capability. We were ready to pull off when two visitors from Bath arrived, so it was decided to ring six bells. The ringing was very elementary — just rounds, call changes and plain course of Bob Doubles. BUT! I had achieved my ambition. I was elated. A plus factor: Mr Davies asked, Would you like to ascend the tower to see the bells? Oh, yes please! Helen, the visitors from Bath and I climbed the narrow, winding spiral stone staircase. What a revelation! The bells hang on one level with a walkway some 4-5ft wide right around them. Everything was immaculate — a far cry from our tower, where the bells hang on two levels and the birds cause havoc! A plus, plus factor: Helen learned to ring at Chipping Campden under the tutorship of John Nicholls. Unfortunately, she did not pursue it. When they heard about this, the St David s ringers insisted she have a go. Despite being somewhat reluctant, she pulled some 20 backstrokes, to which Mr Davies said, You re a natural. Our short break in Pembrokeshire will remain with me until my dying day. As the War had not terminated, no Meeting or Competitions was (sic) held on this date. Annual General Meeting held on Saturday 25th October 1975 in the School House, Quinton, the Guild Master in the Chair. Apologies: Apologies were received from S.C.Holden and Revd R.J.Rothery. Minutes of Previous Meeting: Minutes of the previous Annual General Meeting held on Saturday 26th October 1974 were read and confirmed, and signed by the Chairman. Matters Arising: Badges — the Secretary was unable to report progress in the consideration of a Guild badge; members were invited to put forward ideas for a suitable badge. Membership: The Secretary reported fifty three Residential Members, seven Extra Terrestrial members and ten Honorary Members. Secretary s Report: During 1974 the Guild had increased both ringing and social activities. 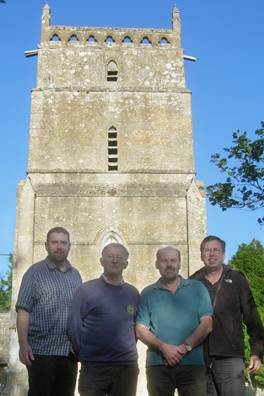 Two half-yearly Ringing Competitions had been held, with teams from Bledington and Chipping Campden entering for the April Competition at Bledington; and from Badsey, Bledington and Chipping Campden for the October Competition at Offenham. Both competitions were won by the Chipping Campden team, and the Spencer Jones Silver Cup (owing to the non-availability of the Shield) was presented to Mr H.O.Hart, representing the winning team, by Revd W.G.Bates, Vicar of Offenham, at the Annual Dinner held on 15th February 1975. The Annual Dinner at the Three Ways Hotel, Mickleton, on 23rd March was attended by twenty-nine members and friends. A small party enjoyed an outing in the Leamington area on 12th October. Membership on 31st December totalled forty-one, with weekly practices arranged throughout the year, some jointly with the monthly or quarterly meetings of other Association Branches. Circulation of the Diary of Events covered all members, tower correspondents and associated Branch officials. This involved printing and circulating nearly one hundred and twenty notices for each quarter. Invaluable assistance with distribution was given by Mr John Nicholls from Chipping Campden High School. The report was adopted. Treasurer s Report: Audited accounts were circulated to members prior to the meeting. A balance in hand of £13-12 was recorded. Expenses had been kept to a minimum whilst maintaining the widest possible distribution for ringing notices. The Report and Accounts were adopted. Elections: On the proposition (in absentium) of Revd R.F.Rothery, seconded by M.F.Fairfax, Revd J.D.Smith (Tredington) was elected Clerical Vice-President. Guild Master: Mr Henry O. Hart, proposed by R.A.Canning, seconded by P.Carter, carried. Secretary and Treasurer: Mr A.J.Brazier, proposed by H.O.Hart, seconded by G.Osborn, carried. Committee: the following were elected — P.S.Carter, C.Evans, M.F.Fairfax, G.Osborn, and R.Payne. Subscriptions: It was agreed that subscriptions for 1976 remain at fifty-pence, and twenty-five pence for ringers under the age of sixteen years on 31st December 1976. Any Other Business: The Guild Master, on behalf of members, thanked the Competition Judges Mr R.Chapman and Mr F.C.Lynes; Revd L.Powell, Revd R.F.Rothery and the organist, for the Service; Mrs Brazier, Mrs Powell and her assistant for teas; and Mr M.F.Fairfax for organising the successful competitions. The meeting was then declared closed by the Chairman. I recently had the pleasure of meeting your editor for the first time at Stow - (now a much improved ring). (It was very much a pleasure to meet you, too, Chris. Ed) He suggested that I might like to write for the newsletter on any matter I like, not just the mid-week tours. Now there's a challenge I could not refuse so here we are. Another passion of mine is that of meditation, and I am increasingly struck (no pun intended) with the similarities between ringing and meditation. How so! I hear you cry, surely meditation is that thing where you sit on the floor, quietly doing nothing? Well yes, it can be, but meditation comes in many forms, chanting, movement, sound; especially that of ringing bells. So let s look in a bit more detail. It is important to understand that meditation isn't something you do, it is something that happens, when the scene is set - a bit like ropesight you can't teach it, it just happens with practice. Firstly, we transcend the physical. By this I mean being able to ring the bell effortlessly without any conscious thought. A bit like riding a bike, you don't think about pushing the pedal with your foot is just happens automatically. This requires good handling and much practice. Second - repetition is important in calming and soothing the mind, both physical and mental repetition. Well, we certainly get plenty of that on the end of a rope, and repetition with method ringing, how many of us can ring bob doubles in our sleep? Third - the need to focus the mind on a single activity. In our case the method, maintaining concentration on that thing, & if the mind wanders to the shopping list as it is wont to do, bringing it back each time to the main focus. The unwanted thoughts that were occupying the minds "current thinking" (like the RAM on a computer) are cleared, allowing the mind to keep attention on the method in hand. The sound of the bells can block undesirable sensory impulses from outside which may distract and disturb the mind. Fourth - An aspect of devotion, such as a dedication for the ringing is helpful. A service touch, a wedding or an occasion, can bring the ringing to a different level. Fifth - a sense of unity, of coming together, where each ringer contributes to the collective effort, the ringer and bell become one indistinguishable unit and then each member of the band merges into one entity. Have you been at this point in ringing where you can practically hear the fizzle and feel the crackle of energy created by a dedicated band? I hope so. It was my privilege recently to experience this on two separate occasions. Both where there was a dedication for the ringing and both where bands were ringing well below the collective ability of the ringers, effortlessly it seemed. It was a joy to behold. Thank you to the other ringers (you know who you are) for not only superb ringing but a truly meditative experience. So next time you are ringing that service touch or quarter, see if your ringing too takes on another dimension, I do hope so. The views expressed here are purely those of your correspondent, through personal experience. We quickly settled into Stedman, Original and Cambridge at Minstead, a modest ring of 6 (tenor 7-0-20 in B), before moving on to Brockenhurst to savour an equally modest ring of 8 (tenor 4-1-12 in B) where we accomplished Grandsire Triples and Plain Bob Major. As usual Rounds and Call Changes were on offer to those who wished. 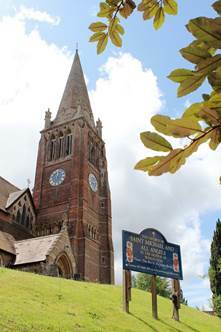 A leisurely lunch was taken in the busy town of Lyndhurst before achieving a reasonable course or two of Grandsire and Stedman Triples on the 8 bells (tenor 11 in G) at St Michael & All Angels Church just a short walk away. Grandsire Doubles with 7,6,8 covering also featured. The realisation (for most of the group) that the next tower, Downton, some 12 miles away in Wiltshire and to be reached by oppressively busy roads whichever direction one chose, meant no delay and seemed to be well worth the visit — the church was a picturesque building in itself and apparently the 8 bells (tenor 22-3-23 in D) went very well. Original Major serenaded the local inhabitants! Yours truly unfortunately had planned his day around an OS map without reference to Dove (well the tour was advertised as Hampshire...) and found himself at the other Downton near the coast at the right time but the wrong place! A frantic dash (or should I say crawl) across the New Forest meant I was able to hear the bells being lowered and see one or two familiar faces making their way back to their cars. A planned visit to Salisbury St Martin was scrapped as no response could be obtained for permission to ring there (for reasons probably left for discerning tour organisers to debate..) therefore Britford became our final tower. Here we were challenged by a heavyish ground-floor ring of 6 (tenor 13-2-4 in F) with one bell, the fifth, having a mind of its own in the raise and at times in the changes which caused some amusement to those spectating. 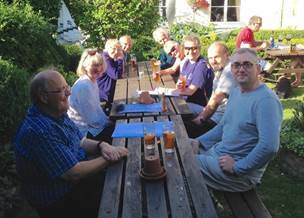 Nevertheless we accomplished Grandsire, Plain Bob and Original before lowering the bells and departing for home or the campsite (with a small gathering taking refreshment en route as the photograph below shows). Thanks once again go to Richard Lewis-Skeath who organised the tour and prompted the ringing throughout the day. BRETWICKHAM — SCALING NEW HEIGHTS! l to r: Stuart Piper, Graham Lee, Bill Wadsworth, Colin Sagar, Jackie Saville, Phil Milward, Alan Curry, Fiona Gibson, Nana Hirayama, John Cleveland, Brian & Christina Ireland, George Jelfs and bells 4, 5 and 6. So the evening of July 20th arrived and a goodly crowd (actually a baker s dozen) ascended the stone staircases to the Abbey belfry to view the 8 bells (tenor 25-2-0 in D) and see the no 4 bell ringing at close quarters. We then joined with the Abbey ringers (6 of them) for their practice night — here everyone in our group rang call changes and acquitted themselves well with two of us enabling Grandsire Triples to be rung. Congratulations to Nana who rang at her first tower away from Bretforton and Alan his second (he having only taken up ringing on May 14th this year). It was a new tower for 10 of our party whilst Phil returned to the tower where he learned to ring in the early 70 s. We are currently scratching our heads to figure out what to do next to eclipse this feat…. Thanks to Stuart Piper (Pershore Abbey Tower Captain) for his time and patience in looking after us on the night. In the July Newsletter I reported on the Central Council meeting in Hull. I said part of the meeting was taken up by group seminars undertaken by the Central Council on conducting a survey on what is happening for the good of ringing in the country and what is not so good, ie what is hampering the recruitment of new ringers or causing ringers to give up. I have now received a request to forward a list of all our members, so a randomly-selected 10% of such can be asked to complete a questionnaire on what they feel are the good and bad aspects of ringing today — presumably as they apply to the Guild. All associations/societies/guilds affiliated to the CC are to be asked to forward a membership list from which to pick 10% to complete a survey. The CC assure me (and the other affiliated bodies) that the submission of members names is legal and above board, on the basis, I guess, that we are effectively part of one overall body. I do not intend to question this and therefore will forward the list of members as requested. As we have something like 207 members at the last count, 21 of us will be asked to undertake the survey. What do I think about all this? I don t know what questions will be asked, or whether they are sensible and capable of discovering what is good and bad, but it s worth a try. We are all aware that many ringers are now in the retired bracket and that younger ringers are conspicuous by their rarity. If the current situation continues ringers will become even more of an endangered species. Sadly the World Wildlife Fund won t be interested, so it s up to us, ie ringers, to do something about it. We need to be aware, too, that it will take a long time before any useful initiatives start to make a difference, so the situation may get worse before it gets better. Worrying, isn t it. The people conducting the survey are clever and I believe they will use the information sensibly to determine what is likely to work and what isn t or won t. You should be aware that they are volunteers, ie not being paid for their time, so I think it is only reasonable that they are remunerated by receiving information to allow them to reach their goals. I have not the slightest idea who will receive a request to undertake the survey. If you do, please treat it as a document that could do some good for ringing and therefore give it your best shot. As said earlier: IT S WORTH A TRY. Tales from a tower near you (5): … THE ONE THAT GOT AWAY! About 15 years ago the quiet village of Dorsington (blink and you almost miss it on the country road twixt Welford-on-Avon and Pebworth) undertook to have its single church bell refurbished. This involved removing the bell from the tower and taking it to a workshop for the cast-in crown staple to be extracted.. Upon its return I decided to record the event with a photograph of the bell, perched on a small hand trolley, nestled up against the vintage signpost which occupies a grass tump in the centre of the village. Perfect! or so I thought......unfortunately (and it happened to me several times over the 40 years or so that I had been taking photographs with old-fashioned film cameras) the film was not being advanced on the take-up spool and so the image was not recorded. A quite timeless scene gone forever (assuming the bell never leaves the tower again) but still vivid in my mind s eye..
Rung for the village NGS Open Gardens event. 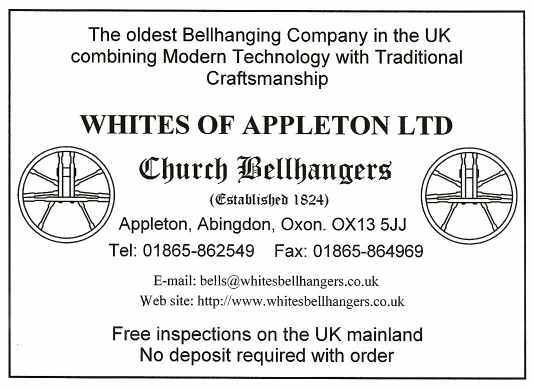 Having attended the Mini-Mouse competition at Wyck Rissington in September 2013, I was struck by how well the bells went for a ring of four. If you have rung at Newbold Pacey you will appreciate how easily the Rissington bells “go”, along with an easy to see ringing circle. After an enjoyable evening of bell ringing I got to thinking if something else could be rung on the bells. A quick check on the Felstead peal database showed the bells had never been pealed. This planted the thought that we should attempt a peal on the bells. This created the question of what method to ring? Thinking back to the Mini-Mouse competition, at the end of the evening a blue line called Wyck Rissington Hybrid Minimus was found on the internet. You might remember reading about in the newsletter No. 138, October 2013. In the article Chris says: “It's a bit tricky until you get used to it. And another thing: it only runs to 21 changes. It doesn't really matter at this level, unless, of course, you include it in a peal of Minimus.” The total number of rows, or extent, which is possible on four bells is 24. Therefore to ring this method to a peal you have to worry about the missing 3 rows. This is where the methods committee of the Central Council of Church Bell Ringers (CC) comes in. To be compliant you have to ring round blocks of two or more extents in which each of the possible Minimus rows occur the same number of times. At this point I contacted Tony Smith of the CC methods committee for advice. He very kindly came up with the following, which is probably the simplest such composition with each of the possible rows occurring seven times. Ringing this composition (or rotations thereof) 30 times would give a peal of 5040 changes. Putting in all the calls would mean 240 calls as well as counting the 30 blocks. This was thought to be quite a challenge so we decided to draw out the whole 168 changes and learn it as one single blue line with each ringer being assigned a rope. A blue line of 168 changes might seem a lot when you consider Plain Bob Doubles is only 40 changes but remember a plain course of Surprise Major is 224 changes long (but S Major lines are generally palindromic, so only half needs learning and it can then be reversed. W/Riss s line isn t palindromic! CMP). One complication here is that each bell is rotated in/out of the hunt, as can be seen in the blue line below where all 168 changes have been written out. Wyck Rissington, Glos, 23 June, 1344 Wyck Rissington Hybrid Minimus (comprising 8 round blocks of 168 changes): 1 Richard Lewis-Skeath, 2 Chris Povey, 3 Roger Hunt, 4 Nick Allsopp (C). First Q in the method. First Q of Minimus 2,3,4. First Q of Minimus on tower bells 1. The thing to note about that quarter peal was how many firsts there were. The method was named in 2004 during a multi-method ¼ peal which was rung at this very tower. But this was the first time a ¼ peal had been rung entirely of the method. Finally the day of the peal attempt arrived. One thing I think was a good point is that the peal attempt was used to help advertise the village s Open Gardens event. There was an advert in the Moreton Times: see photo below. It was interesting to see how many people entered the church whilst we were ringing. It turned out to be a glorious sunny afternoon and after pulling up the bells the attempt began. Luckily although the ringing chamber is on the ground floor we were not distracted whilst ringing the bells. The method is quite tricky and it took some time for the band to settle into a good rhythm. The previous practices however paid off as any slight mistake was soon corrected. After two hours and forty-five minutes the peal was completed. You might think 2hr 45 minute is quite slow for a peal of Minimus with a tenor of 6cwt, but you have to remember the complexity of the method. Also, we discovered the faster you try and ring the method the number of mistakes increased. Not only was it satisfying ringing the bells to a method named after the village, but also ringing the bells for a village event. As a last thought, perhaps when the Mini-Mouse competition goes back to Wyck Rissington we shall see bands attempting this composition of 168 changes or even have it as the set test piece? Now that s what I call a challenge! If anyone has similar ideas for something in the future at another tower get in touch. The forecast for the day was good, some sunshine and some warmth. However when we got to Cropredy, our first tower, it was still a little chilly and I was beginning to wonder if the forecast had been right. Cropredy rang a bell and not for ringing on this occasion. It was because of Fairport Convention, who have held concerts in this attractive village set by the canal. Returning to the bells, these were a nice ring of 8, weight 16cwt, with quite a long draught — two sets of sally guides. As our 45 minutes here was drawing to a closure it was noticeably warmer outside than inside the tower. A seat by the pathway was put to good use taking meal selection and subs for the day. As we left Cropredy there were mutterings that Wardington would be an interesting or challenging 6 and various tales were being told of how the tenor rang or did not! No worries; yes, the ropes were a bit long but nothing that could not be handled on this 16cwt 6. Once again there was a relatively long draught but this time only one set of sally guides. For Jenny who was looking after the ringing it was to be her 1,601st tower, which triggered off conversations as to who kept records of towers rang at and who did not. A good lunch was had at The Cross Tree in Byfield. The pub got its name from the Village Cross and an Elm Tree that was very close by. However, whilst the cross still remains, the tree suffered from Dutch Elm Tree Disease and is obviously no longer there. Following lunch we remained in Byfield and had our only non ground floor ring of the day. By this time our numbers had reduced to about 15, some ringers having to leave before lunch. There was room for all of us in the tower and those not ringing could find a seat. This was a 12cwt ring of 8. It was soon time for us to move on to our final Tower of the day, the 6cwt ring of 6 at Upper Boddington. Driving up to the Church and parking was a little awkward as we competed with Mums collecting children from the local school. A lot of the children were in fancy dress and we were told that it was the last day of the term, hence the dress. Clive did a sterling job here in coaxing us to ring, as we were all feeling a bit wearier than at the start of the day. Our thanks go to Joy for organising the day, some lovely villages in traditional Banbury stone —delightful. The weather was good; it was dry and warm. I must not forget to thank those who organised the ringing during the day, methods ranging from Grandsire through Stedman to Surprise and Double Norwich. Finally thank you to all who turned out not only on this day but on all other FSG tours, without you there could not be an outing. As it was the school holidays, I was able to join the Monthly Tour and get a chance to ring different bells. 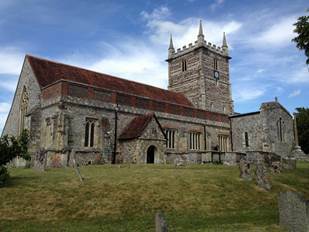 The first tower was St Mary the Virgin, Titchmarsh which has 8 bells. The bells sound good but the long ropes made it difficult. They were hard to pull off and not for beginners. Apart from rounds and changes, Cambridge Major, Stedman Triples and Plain Bob Major were rung. From there we went to the 5 bells of St Rumbald at Stoke Doyle. There are only two churches in England called St Rumbald s! 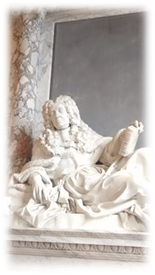 This church has some spectacular monuments and a very beautiful carving made by the man who designed and made Isaac Newton s grave. The bells have a beautiful sound and are the opposite of Titchmarsh - they are light and have short ropes. The methods rang were All Saints, Grandsire Doubles and rounds and changes. We had lunch at the Ship Inn at Oundle. The first tower after lunch was another St Mary the Virgin, at Benfield which had 6 bells which were nice bells but very loud when we were in the belfry. There were long ropes but they didn t really make a difference to your ringing. Methods rung: Rounds and Changes, Cambridge and London. The final tower of the day was the pretty church of St James at Thrapston with 8 lovely bells - you always feel comfortable when ringing them. These bells are good for beginners. Methods rung: rounds and changes, Stedman Triples and Cambridge Major. A good ending to an enjoyable day! I am not sure whether the connection was made when, in the early part of the year, Joy organised this tour from the other side of the world but visiting Rugby on the eve of the 2015 Rugby World Cup was most apposite. Decked out in a manner appropriate to its position as the birthplace of the game, the town looked splendid in the autumn sunshine. Twenty one regulars started the day at St Mary, Clifton on Dunsmore (6), where Stedman, London and Plain Bob Minor were scored. From there, the Rugby one-way system was successfully negotiated for the double delights of St Andrew, where we were joined by 3 more regulars, one of the four-legged varieties, Bella who is an old hand in the ringing chamber. Starting at the 5, we took the opportunity to run through Winchendon Place and St Simon s, that don t get regularly aired on these tours. At the fine 8, overhauled in the 1992, in memory of Sir Billy Butlin, Cambridge Major, Grandsire and Stedman Triples came round successfully, but Plain Bob Major never really got into the right rhythm and was stood up. An amazingly good value lunch at The Rupert Brooke afforded sustenance for the afternoon towers: St John Baptist, Hilmorton (6), where St Clement s provided variety and St Nicholas, Willoughby (6). The last tower was a grab for the majority of the tourists, as until 2013 it had been deemed unringable. Some members of the group had been before it was out of action, but preferred not to be reminded exactly how long ago that must have been! Here we were joined by some of the newly trained local band and we were pleased to provide them with the opportunity to ring rounds and changes with us. Another lovely autumn day, full of first rate bells, friendship and food. 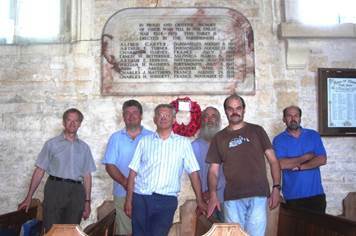 Great Wolford ringers continue their aim to commemorate the eight local men who were killed in the Great War. Rung in memory of Gunner Ernest Hall, resident of Little Wolford, killed by a sniper near Armentieres on 30 June 1915. Rung in memory of local resident, Second Lieutenant Arthur Eustace Stevens MC, who died of wounds at Boulogne, 16th July 1915. Temple Guiting bells were rung half-muffled to remember two men from the village who were killed in the Dardanelles campaign (Gallipoli) in August 1915. I had noticed their names and the dates of their deaths recorded on the Memorial tablet in the Church and resolved to ring a half-muffled quarter, particularly as one date fell on a Saturday. Rung half-muffled in memory of Lance Corporal Alfred Carter, No 19014, 7th Bn, Gloucestershire Regiment, who died at Gallipoli (Dardanelles) on 8th August 1915, age 26; and Private Arthur Richard Turner, No 10876, 7th Bn, Gloucestershire Regiment, who died on 12th August 1915, also at Gallipoli. Both men were from Temple Guiting and their names are recorded on the Memorial tablet in this Church. Photo of Alfred Carter from the website of soldiers of the 7th Battalion, the Gloucestershire Regiment, killed in WW1. Alfred Carter was born in Temple Guiting in 1889, the son of Jesse Carter and Harriet Carter (nee Hyde). They later moved to Kineton, Lower Guiting (now known as Guiting Power). By 1911 Alfred was lodging at 6 Cambridge St., Gloucester, working as a Fitter in an Iron Works. His Will is recorded and shows his estate, worth £141 3s 5d (some £14k today), was bequeathed to his mother. His name appears on the Helles Memorial, Gallipoli, Turkey. Sadly, I can find little about Arthur Turner, except that he died of wounds on 12th August 1915 and that he was a witness to Alfred Carter s Will. At the time of his signature on this Will (September 1914), Arthur Turner s address was Kineton, Lower Guiting (now Guiting Power). Alfred Carter and Arthur Turner clearly knew each well, so it is poignant that they died within four days of each other on the same battlefield. His name appears on the Helles Memorial. Rung to mark the 70th anniversary of VJ Day and in memory of the victims of the two atomic bombs which fell on Hiroshima and Nagasaki. Combe, Oxon, 28 June, 1260 Plain Bob Doubles: 1 Julie Minch,2 Michael Probert, 3 Anthony Williamson (C), Richard Lewis-Skeath, 5 Neil R Ephgrave, 6 Alison T Merryweather-Clarke. Rung before Evensong and in thanksgiving for the life of Julie Bourchier, wife of Chris and mother of Oliver and Jonathan. Pebworth, Worcs, 28 June, 1260 Mixed Doubles (Wellington Place, Plain Bob, Grandsire): 1 Freda Cleaver, 2 Georgie Roberts, 3 Claire Penny, 4 Martin Penny, 5 Matthew Kemble (C), 6 Claire Allen. For the patronal festival; Armed Forces Day and the 200th Anniversary of the Battle of Waterloo. 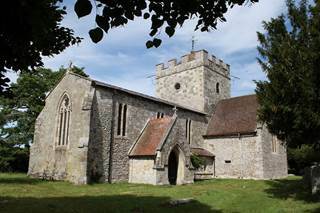 Freeland, Oxon, 3 July, 1260 St Simon s Doubles: 1 Richard Lewis-Skeath, 2 Andrew Smith, 3 Alison T Merryweather-Clarke, 4 Michael Probert, Neil R Ephgrave (C), 6 Melanie McGregor. Bretforton, Worcs,13 July, 1260 Grandsire Triples: 1 Nick Allsopp,2 Lucy Gwynne, 3 Steve Bowley, 4 Chris Povey, 5 Richard Lewis-Skeath, 6 John Gwynne, 7 Roger Hunt (C), 8 Matt Kemble. Rung as part of BretFest (a weeklong programme of art and music 11th - 18th July) celebrating the 120th Anniversary Year of Bretforton Silver Band. Freeland, Oxon, 24 July, 1320 Spliced Cambridge & Beverley S Minor: Simon s Doubles: 1 Michael Probert, 2 Richard Lewis-Skeath, 3 Lindsey Thornton, 4 Alison T Merryweather-Clarke, 5 Anthony Williamson, 6 Neil R Ephgrave (C). 1st spliced: 3,4,5,6. Celebrating the first birthday of Karim Mahgoub Tajalsir. Cherington, Warks, 25 July, 1540 Grandsire Doubles: 1 Richard Lewis-Skeath, 2 Steve Bowley, 3 Isobel Murphy, 4 Michael Haynes, 5 Roger Hunt (C), 6 Keith Murphy. Rung as a wedding anniversary compliment to Bretforton ringers George (& Jeanne) Jelfs celebrating their 40th today and the conductor (& Val Hunt) who attained their 39th yesterday. Also to Keith and Isobel (of Great Wolford) who celebrate their 35th tomorrow. An S@S Quarter Peal and a bit! Stratford-upon-Avon, Warks, 2 Aug, 1260 Plain Bob Royal: 1 Chris Povey,2 Charles Wilson, 3 Sarah Thomas, 4 Jeanette Davey, 5 Rachel Page, 6 Steve Bowley, 7 John Perry, 8 Roger Hunt, 9 Simon Adams, 10 Richard Lewis-Skeath (C). Rung to mark the 750th anniversary, this day, when Prince Edward (son of Henry III) and his Royalist army put to rout the Montfordian rebels led by Simon, godson of Simon de Montfort, at nearby Kenilworth during the height of the 2nd Baron's war (1264-67). 1st on 10 - 3. Bretforton, Worcs, 20 Aug, 1260 Stedman & Grandsire Doubles: 1 Chris Povey, 2 Georgie Roberts, 3 Martin Penny, 4 Richard Lewis-Skeath, Roger Hunt (C), 6 Tom Sandham. Rung as a compliment to local parishioners Angela and Tony Gray on their Diamond Wedding Anniversary today. Freeland, Oxon, 21 Aug, 1320 Cambridge S Minor: 1 Julie Minch,2 Lindsey Thornton, 3 Alison T Merryweather-Clarke, 4 Michael Probert, 5 Richard Lewis-Skeath, 6 Neil R Ephgrave (C). Dedicated to Lindsey's Dad, Jim Cutler, 23 years to the day since he died. Willersey, Glos, 22 Aug, 1260 Reverse Canterbury Pleasure Place Doubles. 1 Stef Whittle, 2 Richard Lewis-Skeath (C), 3 Alison T Merryweather-Clarke, 4 Michael Probert, 5 Roger Hunt, 6 Neil Ephgrave. Rung as a birthday compliment for today to Brian Skeath, father of 2, & congratulations to Benjamin Lewis-Skeath, son of 2, on obtaining excellent GCSE results. An S@S quarter peal. Bretforton, Worcs,22 Aug, 1260 Doubles (Stedman, Grandsire, Plain Bob): 1 Richard Lewis-Skeath,2 Martin Penny, 3 Georgie Roberts, 4 Michael Haynes, 5 Roger Hunt (C), 6 John Cleveland. Rung as a compliment to John Cleveland at his home tower for his upcoming 70th birthday (24 Aug). Buckland, Glos, 29 Aug, 1309 Grandsire Doubles: 1 Matthew Kemble, 2 Richard Lewis-Skeath, 3 Len Morley, 4 Michael Haynes, 5 Roger Hunt (C), 6 Steff Whittle. Remembering Claire Tarrant of Oxfordshire, a ringing friend of Michael. An S@S quarter peal. Oddington,Glos, 2 Sept, 1344 Wyck Rissington Hybrid Minimus (8x round blocks of 168 changes): 1 Richard Lewis-Skeath, 2 Chris Povey, 3 Roger Hunt, 4 Nick Allsopp (C). Bengeworth (Evesham), Worcs,5 Sept, 120 Grandsire Doubles: 1 Claire Penny, 2 Robert Hall, 3 Simon Adams, 4 Martin Penny, 5 Chris Povey (C), 6 Roger Hunt. A test ring following inspection and adjustments at the request of the vicar and churchwardens and rung as a welcome to Sarah Dorey upon her arrival for her marriage to Mark Hemsley. Cropthorne, Worcs,5 Sept,, 1260 Mixed Doubles (Stedman, Grandsire, St Simon s, St Martin s, Reverse Canterbury, Plain): 1 Richard Lewis-Skeath (C), 2 Sue Bacon, 3 Roger Hunt, 4 Michael Haynes, 5 Steve Bowley, 6 Stef Whittle. A birthday treat for Ron Stephens, a lifelong ringer at this church, who was 83 on 1st September. The band wish to associate Thelma James & Rob Newman with this quarter. An S@S quarter peal. Offenham, Worcs, 1260 Grandsire Doubles: Tom Sandham, 2 Roger Hunt, 3 Georgie Roberts, 4 Claire Penny, 5 Matthew Kemble (C), Chris Povey. Bretforton, Worcs,120 Call Changes, 1 Roger Hunt (C), 2 Tony Shilham, 3 Alan Curry, 4 John Cleveland, 5 George Jelfs. Rung by local band members. Also 1380 Doubles (Stedman, Grandsire, Plain Bob): 1 Matthew Kemble, 2 Chris Povey, 3 Tom Sandham, 4 Georgie Roberts, 5 Roger Hunt (C), 6 John Cleveland. The band wish to associate this quarter peal with the W&DCRA (Southern Branch) with which they have joint membership. Great Wolford, Warks, 15 mins of Call Changes including Queens: 1 Shirley Wrench, 2 Isobel Murphy/Imogen Murphy, 3 Keith Murphy, 4 Caroline Murphy, 5 Steve Duck, John Wrench. Rung at 6.30pm. The Stratford Herald carried an article on the bells rehang proposals at Pillerton Hersey (thank you, Peter Richardson, for sending a cutting of this through). By coincidence the Committee received at much the same time an application for a grant towards this scheme. As will be seen from Committee Notes (p.4) a grant of £500 was offered towards the work. One or two people have enquired whether this tower is within the Guild s area of operation. It is. If a line is drawn between Butler s Marston and Tysoe, Pillerton Hersey lies just inside. There are three bells, which were rung until recently, when their condition deteriorated to unringability. The proposals include making the bells ringable once more by strengthening the bellframe and its underframing, providing the bells with new fittings and adding one bell. Room is available to add another bell at some time in the future. The bells are regularly chimed for Services by an enthusiastic band of chimers . They have found a suitable bell to add to those in the tower, but there are a few legal hoops to jump through before that is available. Good luck with their intentions! As we have lost a 4 recently (Stanway; now 5), another 4 would be useful for our famous Minimus competition. Adlestrop is progressing. By the time you read this, the process for obtaining a faculty for the work should be well on its way to being so (the Public Notice stage has arrived and the DAC are seeking comments from interested bodies). Work can start in earnest when the all-important legal piece of paper has been received. Ringing for Easter 2016? 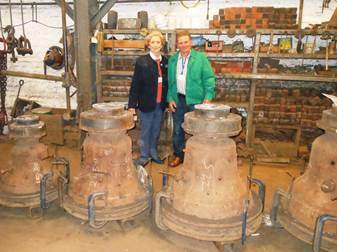 The following photo is local resident Mrs Jinny Holt, one of the donors of the new bells, standing behind the mould which contains her newly-cast bell (the one on her right, marked 21.50 ).The other person in the photo is Ralph Price of Adlestrop, who has, for at least the last 10 years, been raising interest in the village to get the bells rehung (yes, it sometimes takes this amount of time….). Ralph used to ring at Adlestrop before they became unringable in about 1975. He knows he will be expected to take a rope at the eventual dedication service, so some refresher courses will happen in the near future. He will have to learn not to face the wall while ringing…. (those who have rung at Adlestrop will understand what that means!). There is work to be done to Sherbourne s bells, which some feel are harder-going than in the past. Work to the old-style clapper hangings are high on the list. Other work may be considered. Sharp-eyed readers of the peals, quarters and other ringing columns will have noticed some ringing at a rare tower: Bengeworth. This tower is not just rare, it s super-rare. Ringing stopped in the 1920s. It restarted in 1989 and continued until 1994, after which the PCC decided not to undertake rehanging work. The bells then became labelled unringable again. So what happened to allow this unringable tower to ring? A series of personnel changes at the Church occurred recently, which removed some unringable people . The new regime was open to the possibility of the bells being rung, as were some parishioners. 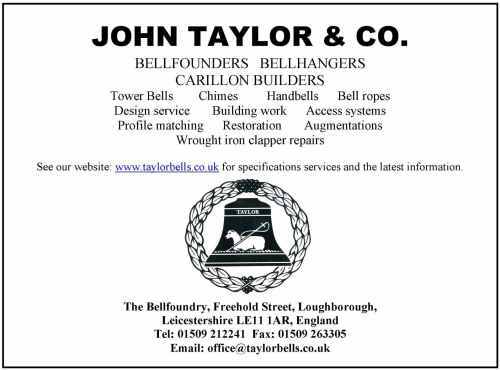 An offer to bring Taylors in to inspect and give a quotation for rehanging work was accepted and Simon Adams from Taylors arrived at 9.30am on September 5th with the intention of ringing each bell up and hopefully ringing the lot. Volunteers to assist with this were asked to stand by. Simon was assisted by Roger Hunt (lots of experience in the bellhanging field) and Chris Povey. They arrived to find a wedding was booked for 12.30pm. Wouldn t it be nice if the bells could ring for this? To cut the story short, the bells did indeed ring before the wedding — all 6, even if one didn t have a slider! This was probably the first wedding at Bengeworth to have bells for nearly a century (no weddings were rung for between 1989 and 1994). The bride and groom wouldn t have realised the significance. The bells aren t easy-going and the neighbours will take some time to get used to this new sound amongst them. It s a case of watch this space . The PCC will be discussing the bells at their next meeting, regarding what should happen to them. Let s hope they want bells! Things may be happening at Blockley. Anne Bourne tells me the PCC has plans to rehang the ring in the fairly near future and is currently seeking competitive quotations for the work. This is likely to include a new bellframe to replace the very poor Bond of Burford girder frame. ……..and another. All praise to El Pres! I was chastised by El Pres for amending his original spelling for shute to chute in July s crossword. 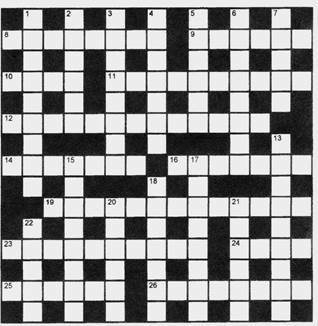 Apparently the clue contained an anagram for dustsheet (17 down: see below). Sorry to confuse you, Phyllis! IMMEDIATELY AFTER THE SATURDAY EVENING PRACTICE THERE. AS PREVIOUSLY, DRINKS AND EATS REQUIRED. PLEASE BRING WITH YOU. Peter suggests a price of £2,100, but this may be negotiated. Saturday 6th February 2015, at The Royal White Hart Hotel, Moreton-in-Marsh, Glos. PRE BOOK YOUR PLACE TO ONE THE FOLLOWING BY 16TH JAN 2016 AT THE LATEST. Nominations open on 15 September 2015 for the new ART Awards. These Awards are open to everyone - not just ART Members or those using 'Learning the Ropes' scheme [unless otherwise specified]. The aim is to encourage and recognise the people and groups leading best practice and innovation in the teaching and development of ringing. A significant prize will be presented in each category. These prizes will be of real value and may be spent in a flexible manner, to be agreed with the winners, so that l value is added to the group / activities undertaken by the winners. The Award Winners will be announced in February 2016 and prizes will be presented at the ART Conference 2016 at Taylor's Bell Foundry in Loughborough on 12th March. The ART Award for Innovation in the Effective Use of Technology in Teaching- sponsored John Taylor & Co. The ART Award for Innovation in Recruitment or Retention - sponsored by AbelSim. All LTR Level 5 achievers with an overall winner. Further award categories will be considered in future years and suggestions for this and offers of sponsorship are welcome. You can enter as many categories as you would like, but a separate form / application should be made for each category. Who can enter? Please feel free to nominate yourself or the group that you are part of - don't be modest - we want to encourage good practice and new ideas! If you would like to nominate a group or an individual but do not feel that you are the best person to make the application on their behalf, then please contact artawards@ringingteachers.co.uk and the ART Awards Leader will attempt to assist. Applications are welcome from anywhere in the world. It would be helpful if electronic applications were sent in PDF format. Postal applications will be accepted. Energy, success and achievement - however you would like to define this! Best practice, innovation and activities of educative value. Structured learning, goals and planning. Involvement of the wider community/school. Examples that others could follow, emulate or adapt to their own circumstances. The judging team will be led by Stephanie Pattenden, ART's Independent Educational Standards Chair. The judges' decision is final. ART may wish to publish and circulate certain aspects of the submissions as examples of good practice / innovation in appropriate media formats and potentially for wider PR use - so we would expect your consent to this (although this would not be done without prior consultation with you). The ART Awards Leader or the Judges may seek to verify certain aspects of your submission and/or visit your group. Every year the Guild Rules require that members are elected to the posts of Guild Master, Hon Treasurer, Hon Secretary and Ringing Master (the Guild Officer posts). In addition, six members are elected to serve on the Committee. The AGM is at PEBWORTH on SAT 17th OCTOBER (Notice and details in the July newsletter). Firstly, please consider standing for these posts. Secondly, if not you, please propose candidates. The Guild's Inter Shire Contest now runs every other year, alternating with the Minimus Contest. It's the Inter Shire Contest this year. This event pits the striking competition winners of Gloucestershire, Worcestershire, Oxfordshire and Warwickshire against each other. It is the best against the best - and it's run by the Guild! This event will be held, pm, at St EDWARD'S CHURCH, SHIPSTON-ON-STOUR, on SATURDAY 21st NOV. Help will be required with catering and other arrangements to ensure everything runs well. The Guild is 'on show' to the other associations! Please contact John Nicholls about helping. Please contribute something, however small (or large). You would be surprised the things people enjoy reading about.. They will all be welcome…. and don’t worry if you think your handwriting is unintelligible. It can normally be translated. Just send the stuff in! Inter Shire Comp Sat 21st November. Organiser 'El Pres'.